You can import pre-made websites via The7 > Pre-made Websites interface. You can search for the demo by demo name or URL. 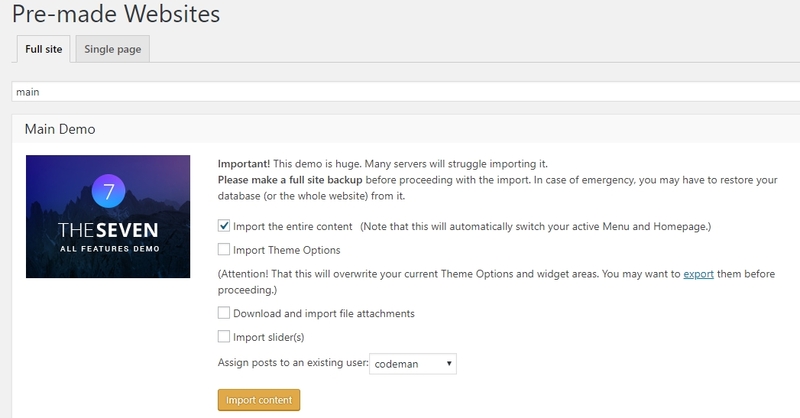 There is an option to import a Full demo site or some specific pages from a demo. If you are testing different demos and going to remove demo content later, it would be wise to create a new user and assign demo content to it. Later, you can filter demo content by author and remove it or delete the user along with demo contents. To avoid timeout issue while importing demo, import one at a time, ie first import the contents, then the attachments, sliders etc. Pages, posts, portfolios etc, Please note that importing content multiple times will cause duplicating menus. Website design like header layout, menu style, buttons styles, colors, fonts etc. Attention! That this will overwrite your current Theme Options and widget areas. You may want to export them before proceeding. Images or image placeholders used in demo. Sliders used in the demo. If you have not installed required bundled plugins yet, you’ll see an offer to make it directly before the demo import. You can contact your hosting company for more details and assistance on it. Copy paste the URL of the page you want to import from any demo, and click Import. You can find all available PSD and other graphical resources from our demos here. Please refer to WPBakery Page Builder > Design Settings and click “Save”. Find GO Pricing Tables demo inside theme ZIP pack, /Pre-made Websites Resources/ folder and select demo content you need. For example, Go_pricing_tables-main.txt for the Main demo. Follow Dashboard > GO Pricing > Import & Export, select action: Import, select demo file and import. If you feel that this article is irrelevant or incomplete, please take a few minutes to send us a message via ThemeForest profile, or our site. Thank you so much for helping us making your theme better!